Susana Rubio Jara and Joaquín Panera, archaeologists at the Centro Nacional de Investigación sobre la Evolución Humana (CENIEH), have participated in a paper published in the journal Quaternary International which reviews more than 40 Pleistocene archaeological sites in the vicinity of Madrid, in the valleys of the rivers Manzanares and Jarama where one of the greatest concentrations of remains of elephants and mammoths in Europe is found. The study of the remains of these large mammals, from the taphonomic point of view, has allowed it to be determined that, while the number of sites where their use is documented during the Lower Palaeolithic is generally much higher in Europe, in these Madrid valleys they are more frequent in the Middle Palaeolithic. “This indicates that for the Neanderthals who wandered around the valleys of the Manzanares and Jarama, the proboscideans comprised an essential resource too, and implies that human groups with different lithic technologies, Acheulean and Mousterian, exploited this animal resource repeatedly over time”, comments Rubio. 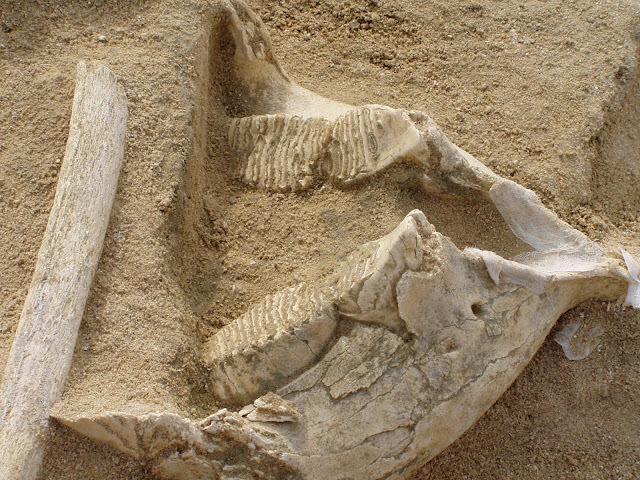 Ever since remains of elephants and mammoths associated to lithic pieces were documented in the mid-nineteenth century on the San Isidro Hill in Madrid (opposite the former Vicente Calderón football stadium), there have been numerous discoveries of these large mammals in fluvial deposits of the middle and lower courses of the valleys of the rivers Manzanares and Jarama. As Susana Rubio explains, this is a key area for studying the relationship between human groups prior to our own species and proboscideans. “Elephants and mammoths are key species in the ecosystems they frequent, and their trails are used by other mammals, including hominins. Thanks to their complex mental maps, they know the location of sources of water, mineral and plant resources and their annual variations, which would have facilitated the occupation of new territories for our ancestors”. In this paper, entitled Hominins and proboscideans in the Lower and Middle Palaeolithic in the Central Iberian Peninsula, José Yravedra, lead author, and Juan Antonio Martos, from the Universidad Complutense de Madrid and the Museo Nacional de Arqueología respectively, also participated.